Treva Entertainment is publishing a new development and care simulation for the Nintendo 3DSTM. This is where up-and-coming vets can treat their feathered and four-legged favourites and make them well again. Hamburg, 29th May 2014 (NOE) / 24th April 2014 (NOA) - in the Nintendo 3DS game “Me & my furry patients 3D” from TREVA Entertainment GmbH, players slip on a white coat to take care of poorly pets. The waiting room is full of concerned pet owners with their dogs, cats, rodents, birds and even horses. 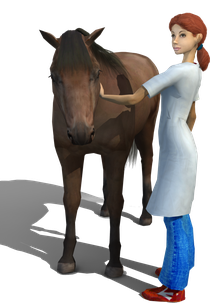 The animals come to the veterinary surgery with the widest range of symptoms: from lack of appetite, fever, ear-ache, right up to vitamin deficiencies – there are a total of 56 different kinds of sickness which have to be cured in the course of the game. To do all of this, the young vets have to select from a broad spectrum of possible treatments. Ultrasound examinations, bandaging, giving injections, administering medications, applying ointments, measuring fevers, using a magnifier and tweezers to remove foreign bodies and lots more. All of this means that players are able to do all kinds of things to make the birds and animals quickly well again, difficult cases can also be admitted to be treated as in-patients. The animal patients are housed in attractive kennels, enclosures, aviaries and stalls, all of which can be constructed and extended in the course of the game. There is even a therapy centre which can be built in the practice’s grounds in which animals can, for example, undergo exercise therapies and receive massages. A loving, caring treatment style does contribute to healing our feathered and four-legged friends - so it’s not just all about regularly feeding the animals with the right food – cuddling and stroking is also very important to the animals’ well-being. Getting out into the fresh air is a regular event: taking dogs walkies or an extended ride out through the meadows and woods with their own horse – and these kinds of activities recharge our young vets’ batteries. So that players can quickly get about in the extensive landscape, the game also supports control via the Circle Pad. Just as in real life, players need to continuously train and they can pick up all kinds of useful knowledge about animals in the Academy. Another aspect of the game is learning good housekeeping with the money they earn, and the young vets can do this when they go the nearby town to stock up on food supplies and visit the pharmacy for fresh medications. There is also a local advertising agency - after all, new potential customers need to hear about this wonderful veterinary practice too! If a vet meets another player in StreetPassTM mode, then the animals’ health values will rise, there are additional rewards of medications and game currency. Game currency can also be exchanged for collected Play Coins. And there’s another entertaining feature: Players can use the Nintendo 3DS camera to take a real 3D photo of themselves and use it in the game. Exciting development and caring fun in real 3D! And there’s lots of fun with different possible actions such as stroking, going walkies, ride outs, shopping expeditions, feeding and playing. “Me & my furry Patients 3D” is available right now at €29,99 / $29.99 in the Nintendo eShop on Nintendo 3DS. Images and further information about our titles can be found on our media server.